Great Basin console - What brand is it? Thanks! Hi Bruno, yes Romo has been discontinued, however similar basins are available from Catalano. Similar rounded corners are available in the Green and Projections ranges, while Premium Up offer the flat surfaces next to the bowl (however the design is much more linear, but absolutely stunning). Thanks for the updated information Rogersellers on other options to consider for this look. Bruno asked this question over 2 years ago so hopefully he found an alternative at the time. is this wallpaper in the french grey colour ? Where can I find the tropical metallic gray/gold powderroom wallpaper? 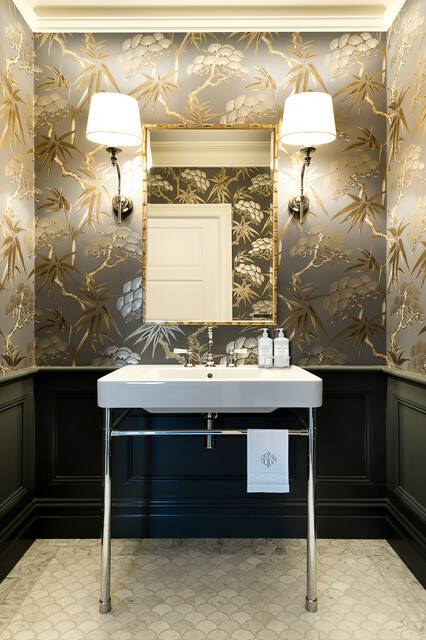 - Love, Love Love the Silver and gold tropical metallic wallpaper in the powder room!! Please advise where I can find it? Please tell me about those beautiful wall sconce lights! Hi Samantha, these wall sconces are from Emac and Lawton, called the Soho wall sconce. http://www.emac-lawton.com.au/wall-lamps/soho-curved-wall-sconce-base-shiny-nickel-elpim50002sn.html You will probably find it via online retailers or you can purchase this light via Karen Aston Design. WALLSMetallics have made their way into the long vanity legs as well as the elaborate wallpaper gracing this powder room. Consider pairing gold and silver bathroom elements with black for a theatrical effect. Balance with panellingThis powder room successfully boasts shimmering wallpaper to give the tiny room loads of personality and interest, but combines it with panelling around the lower part of the room. To help counterbalance the overpowering effect of the wallpaper’s golden colour and pearly finish, only half the room is papered – a dado rail separates the dark grey panelling from the glow above it. Note the simple choices for vanity, mirror and scones. The wallpaper should be the focus here, with everything else playing a supporting act. Down-facing wall lights in the bathroom should be used in conjunction with other lights so shadows don’t get in the way. Unless, of course, you’re trying to create a darker, moodier space as one might in a powder room.